Pat and Baiba have a range of A/V shows they present in person all over the planet. The shows are a mix of live storytelling, video/audio clips and award-winning stills, and run about 60 minutes each. Please contact them for details. Note: this presentation is available through Pat Morrow or Jeremy Schmidt, or the combination of the two of us. This is our most current, and most popular show. 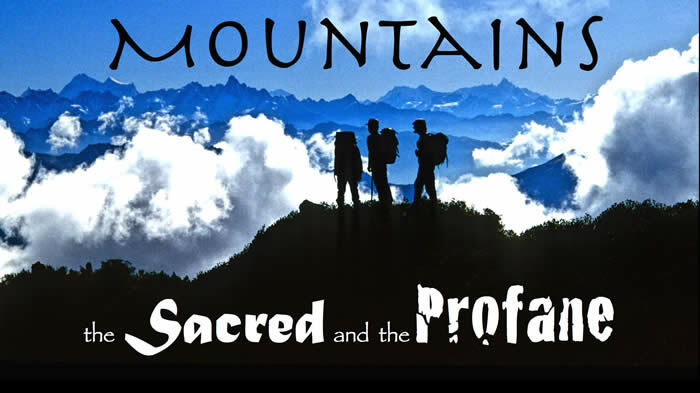 In their multi media presentation, Mountains: the Sacred and the Profane, Pat and Baiba Morrow reflect on three decades of high adventure: from their search for sacred hidden valleys in the Himalaya, Andes, and other far flung mountain ranges to local climbs, hikes and environmental efforts aimed at keeping the mountains wild and free. The Morrows believe that contemplation of sacred places, whether they are the 6,600m Mt. 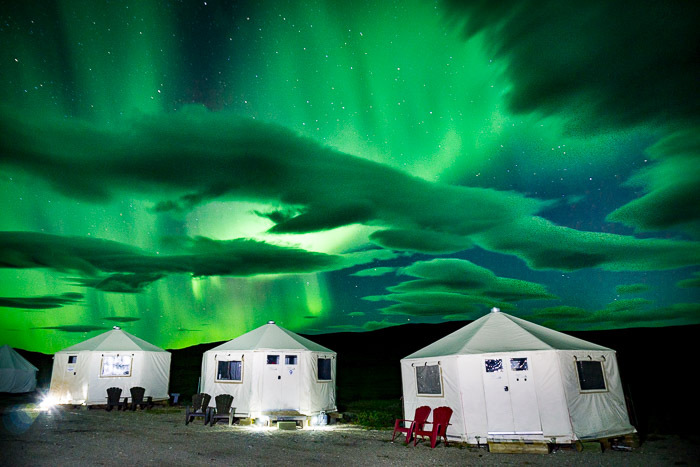 Kailas in Tibet or Qatmuk (where the spirit of the grizzly bear lives) in the Jumbo Valley of the Purcell Range in British Columbia, can help us appreciate the value of wilderness. This leads to treating the environment with care and respect, and instills pride and a sense of place. 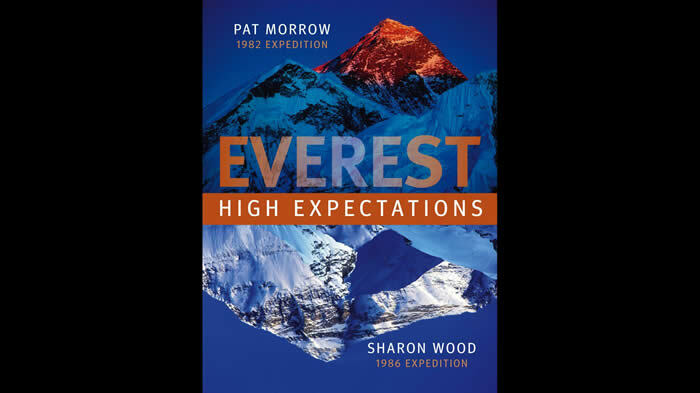 Pat Morrow will give a slide and video presentation based on Morrow’s and Sharon Wood’s recently launched eBook, Everest: High Expectations, which reveals the heart breaking, and ultimately triumphant story of Canadian climbing expeditions that captured the attention of Canadians in 1982 and 1986. The stories and images in the show will be drawn from their formative experiences in the Rockies and abroad during their Everest “apprentice” years, their respective contributions to attempting new climbing routes on the Nepal and Tibet side of the mountain, and reflections on how climbing standards have plummeted on Everest and other crowded iconic peaks in recent years. Pat’s A/V presentation, Quest for the Seven and a Half Summits will describe how, as a non-millionaire, he found the resources to become the first climber to reach and climb the highest peak on each of the seven continents. The logistics and political protocol he pioneered to get himself to Antarctica’s highest peak, Mt Vinson Massif, and Australasia’s highest, Carstensz Pyramid, paved the way for over 300 others to complete this project to date. 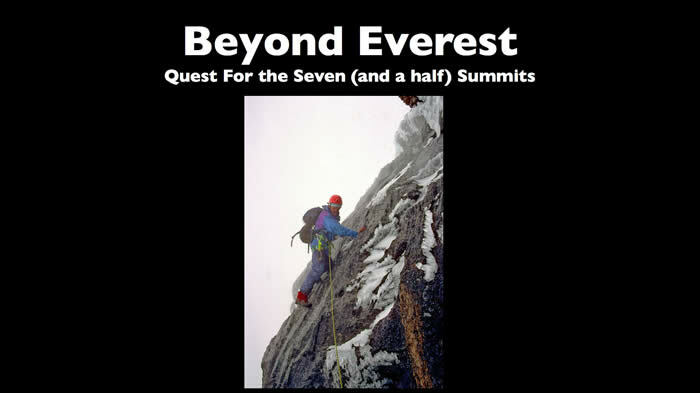 The show is based on his best-selling (now out of print) book, Beyond Everest: Quest For the Seven Summits. Heart of the Himalaya reveals the beauty, the wonder and the resilient heart of the people who inhabit the world’s loftiest mountains, the 2400 km long Himalayan range. 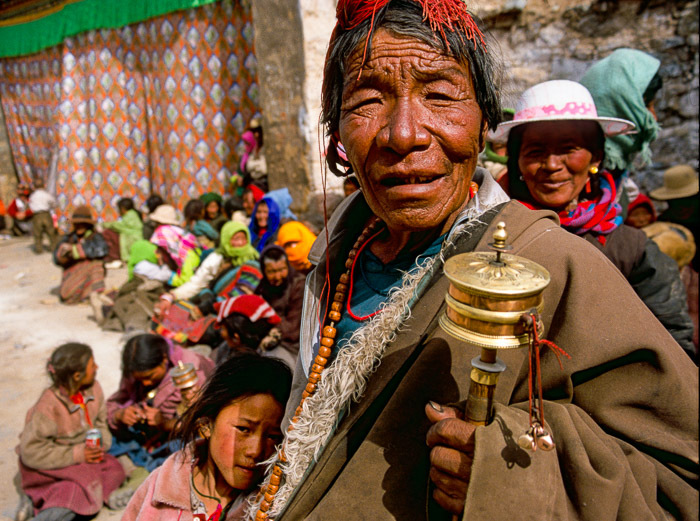 Pat & Baiba’s hour long A/V presentation distills decades of travel and immersion in the Himalaya into a celebration of its diverse mountain cultures. On bike, on foot, on climbing expeditions, on assignment to document events and rituals, Pat and Baiba collected their own nomadic vision of being a denizen of the Himalaya. 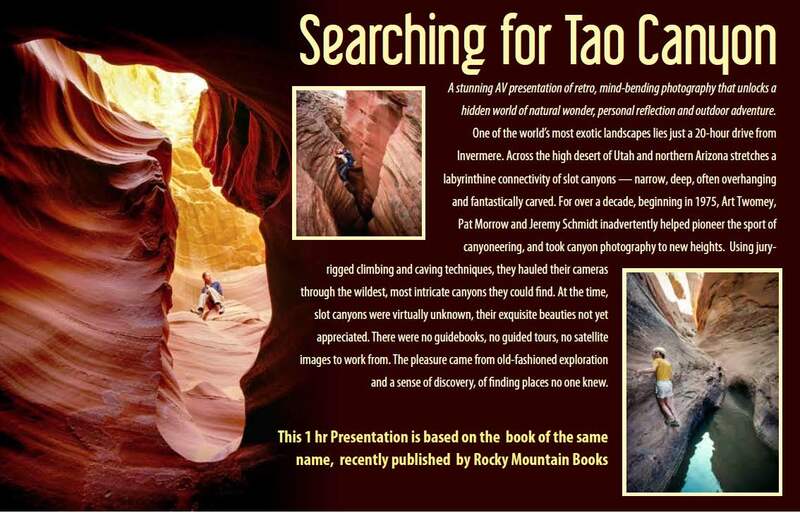 The presentation has its origins in a photo exhibit at the Whyte Museum of the Canadian Rockies that morphed into an eBook. Photos and video clips from Tibet, Nepal, Bhutan, northern India and Pakistan, and China’s Xinjiang Uygur and Sichuan provinces. Created in 2005, TMNP is one of Canada’s newest national parks, and one of the hardest to reach. This presentation takes the form of a travelogue that gives an historical and contemporary overview of Inuit culture, which leads to the adventure of scouting future hiking routes in the rugged mountains that rise 1600 meters out of the iceberg-tossed North Atlantic ocean. These northern lands are among the most culturally fascinating and environmentally important and sensitive in our country. Our musician friend Ian Tamblyn has plied the coast of Labrador numerous times as an onboard troubadour with Adventure Canada’s shipborne tours, and has generated a treasure trove of music. 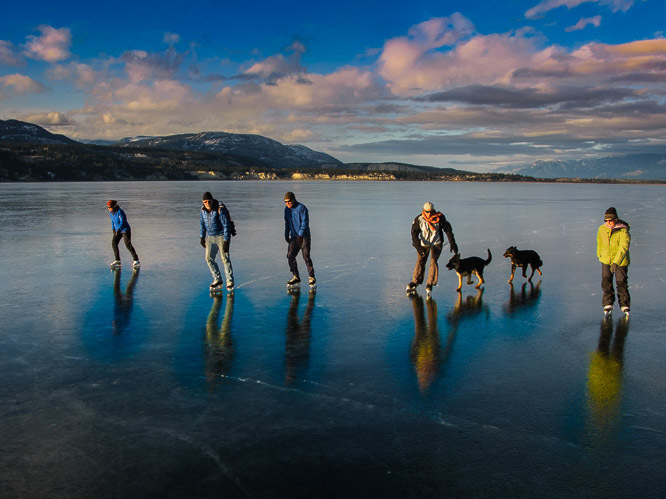 He sent us the album, “The Labrador” which was inspired by journeys of the heart, and I’ve chosen a song called “Coast of Labrador” to accompany some of the images shot while on assignment in the park. Also, there’s a video clip of a throat-singing performance by Inuit artists Evie Mark and Akinisie Sivuaraapik. Austrian Conrad Kain served as a guide for nearly 30 years in Europe, Canada and New Zealand, and during that relatively short period, he left a unique and unequalled legacy of mountain exploration and first ascents. In moving through extreme landscape, he displayed a creativity that stands alone not just in the annals of Canadian mountaineering, but in that of the world climbing scene in the early 20th century. Yet, he lived a simple, independent life and always saw himself as a man of nature. In this A/V show we’ll follow in Kain’s footsteps up some of his iconic peaks, while introducing local teens to the granite spires of the Bugaboos and to the Canadian Rockies’ highest peak, Mt Robson. 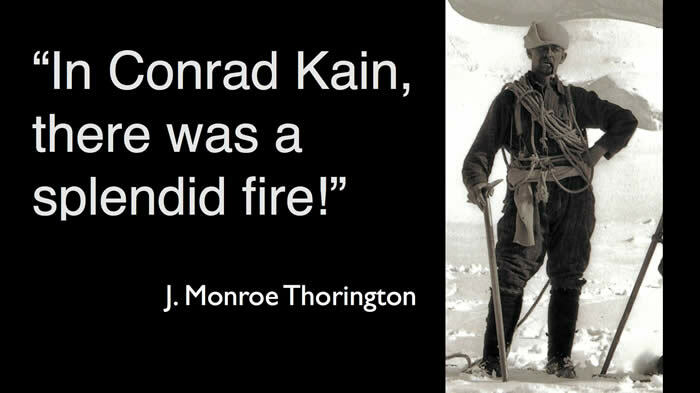 We’ll also get to know some of Kain’s contemporaries, such as Albert MacCarthy, who Kain taught how to climb, and who went on to lead the first ascent of Mt Logan, Canada’s highest. Visit the Conrad Kain Centennial Society website. This multimedia show, created for Invermere’s “Wings Over the Rockies Festival“, gives a four season look at photographer Pat Morrow’s big back yard, from close up encounters with river otters and birds of prey to hikes and scrambles to the tops of peaks on either side of the Rocky Mountain Trench that offer goat’s eye views of the Purcells and Rockies. 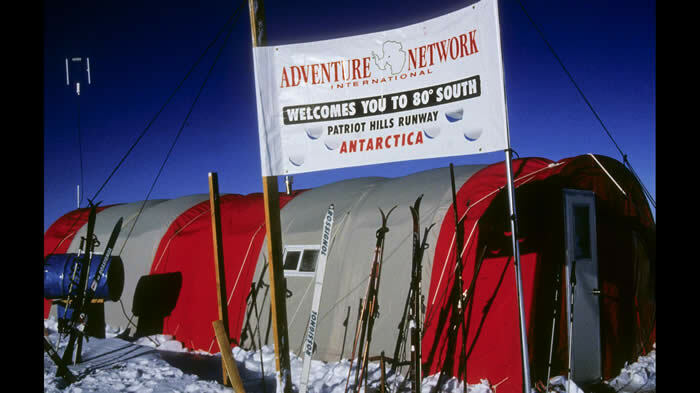 In order for Pat Morrow to complete his Seven Summits Quest in 1985, he needed to reach Antarctica’s highest mountain, Vinson Massif. He’ll describe the challenges of how, with a handful of mountain and adventure travel guide friends, he formed the travel logistics company Adventure Network International. He’ll give a brief overview of classic exploration beginning with Scott and Amundsen, and the ongoing evolution of high-end adventure climbs and ski journeys on the icy continent. 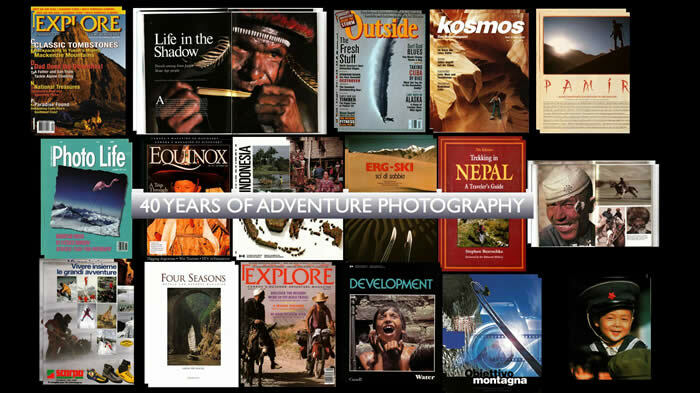 On a personal level, Pat will show stills and video footage that he shot during the first several seasons of operation as he “migrated” from Canadian winter to Antarctic summer, covering a range of climbing and overland ski expeditions and remote tourist destinations that ANI provided access to, and still does. In 1981, Pat Morrow set the world altitude record for telemark skiing when he cranked breathless turns off the top of 7,500m Muztagata in the Pamir range, Xinjiang region of China. At this stage in his adventure career, he had already climbed three high peaks, using skis on two of them. He would go on to use skis on eight more high peaks, and on dozens more exploratory tours in exotic mountain locations, from snorkling through the chest-deep yuki in the Tokachi range on Japan’s Hokkaido island, the steely-ice slopes of Kamchatka’s highest volcanoes in Russia, using penguins as ski gates on Antarctica’s King George Island, making a first ski descent of a 4000m peak just hours from downtown Santiago, Chile, and many other prime skiing locations around the globe.. 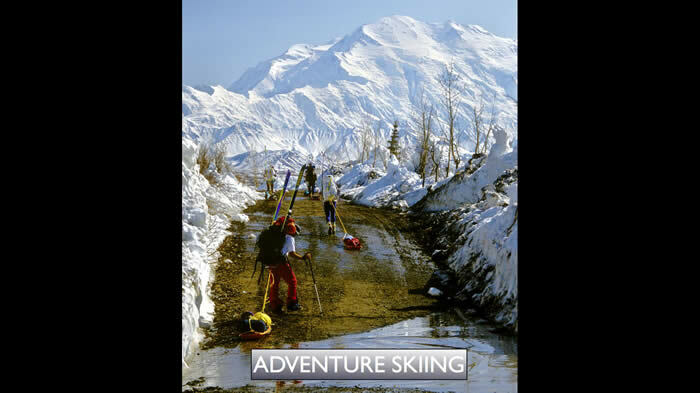 This A/V show reflects Pat’s passion for skiing at any altitude or latitude, and opens audiences’ eyes to the potential for seeking out and savouring ski turns all over our small blue planet. Lynn Martel’s introduction to the Alpine Club of Canada’s booklet Focused on Adventure does a good job of summing up Pat’s professional photographer’s life, and the content of this show.